Κτισμένο το , το Taman Dewangga αποτελεί ξεχωριστό σημείο σε Μπαλί, καθώς και έξυπνη επιλογή για τους ταξιδιώτες. Μόνο μακριά, αυτό το 2 αστέρων ξενοδοχείο είναι εύκολα προσβάσιμο από το αεροδρόμιο. Με την βολική του τοποθεσία, το ξενοδοχείο προσφέρει εύκολη πρόσβαση στους προορισμούς της πόλης που πρέπει οπωσδήποτε να δείτε. Επωφεληθείτε από ένα πλήθος ασυναγώνιστων υπηρεσιών και ανέσεων σε αυτό το ξενοδοχείο της Μπαλί. Μια επιλογή από εξαιρετικές ανέσεις όπως τα δωρεάν WiFi σε όλα τα δωμάτια, υπηρεσία ταξί, υπηρεσία εισιτηρίου, 24ωρη ρεσεψιόν, χώρος στάθμευσης οχημάτων σας περιμένουν στο ξενοδοχείο. 2 δωμάτια μοιρασμένα σε ορόφους παρέχουν ένα ζεστό και ευχάριστο σπιτικό μακριά από το δικό σας. Σε επιλεγμένα δωμάτια θα βρείτε μοντέρνες ανέσεις όπως επίπεδη τηλεόραση, ασύρματη σύνδεση internet (δωρεάν), κλιματισμός, γραφείο, ανεμιστήρας. Η πλήρης λίστα των ψυχαγωγικών υπηρεσιών είναι διαθέσιμη στο ξενοδοχείο, συμπεριλαμβανομένων των μασάζ, κήπος. Με την ιδανική του τοποθεσία και τις καταπληκτικές του υπηρεσίες, το Taman Dewangga θα σας ευχαριστήσει σε πολλά πράγματα. The facilities is not too good, no room have air conditioner. The street is small and dark in the night, but the price is attractive, staffs are nice. The architecture and decoration are very unique. If you like art, you can experience. Good location in the center of Ubud. Beautifully decorated interior courtyard. Large comfortable terrace. With a garden and fountains. Very quiet. Free tea and coffee. Very polite staff. But, the electrical outlets work poorly. In the dormitory room bedbugs! I was bitten. In the shower the sewage is clogged. If it were not for these disadvantages, I would say that this is an excellent hostel. Very cheap, really clean and quiet place with aircon and even hot water in the heart of Ubud city! Just in case the bed linen can be changed. Everything else is great. The lodge is located at a good location, but a little difficult to find as we arrive quite late. Moreover, there's no staff at the time we arrived and no notes left at the reception area to tell which room was our room, so we spend about an hour to seek for the room key. We found the key at staff counter, so we thought it's our room. We moved in the room, then it turned out that it's not our room, so we had to change the room again during the night. Close to the metro station and big shopping mall. Clean and spacious. Would like to stay again. Our group of 7 people booked a villa for 2 night staying in Ubud. 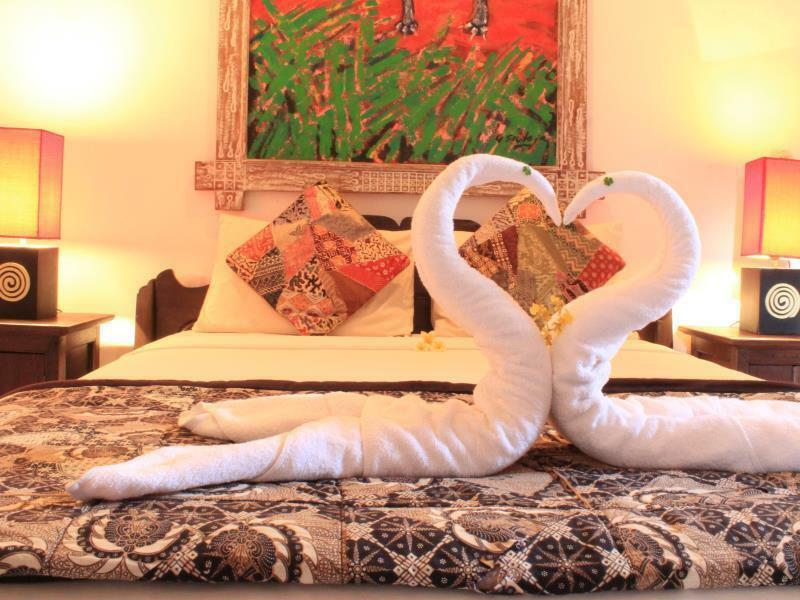 As my boyfriend&me went to Ubud 1 day sooner than the others, we booked a double room for 1 night staying in Taman Dewanga at an affordable price. The room is dark and facilities are old. However, the location is an advantage and the staff is super friendly, they dropped us off at the massage shop and kept luggage for our group on the next day free of charge. it was nice place to stay if you go to ubud, the location is close to the shopping district, only minutes away. This place has balinese feel, and very comfortable. The place is very calm and peaceful. Staff is very nice. Room is old but nice. Unfortunately the mattress was very used and we can't sleep well. Light in the bathroom didn't work. Toilet wasn't comfortable :-D Hot shower was good but weak pressure. Breakfast could be better. But overall I can definitely recommend it for that price! The whole place is crawling with bedbugs. Still dealing with it, so the money you save living here is made up by washing everything you own. Twice. I like the location of this homestay because it's close to the main road. Room rate includes breakfast (French toast and coffee) There is unlimited coffee and water when you need one. Rooms were okay but I think there should be hot and cold shower. Foam bed was too soft causing backache. It gets hot during the day. Staff were pleasant. For super budget and those not having a bike it's just near the main street which means get BUSY daily. Great location, very kind staff, good breakfast, room is big and the homestay is beautiful. The wifi is very slow and they could pay more attention on the cleanliness. I arrived at 2:00 AM from the airport. I had booked a bed in the dormitory the previous night. When I arrived, no one was there to check me in. I called their phone number and security answered, but only to say that no staff was there to check me in. He hung up and said he would try to help me. However, he never returned my phone call and refused to answer my subsequent 5 attempts to reach anyone who could assist me with getting to the bed I paid for. This was absolutely atrocious customer service and I strongly would not recommend other travelers to stay here. No air acon. The first night they gave us a.wrong room and we had to wait for the second night to get ours. not even close to the pics. The room didnt have any windows so it was dark and creepy. Breakfast was simple but tasty. near ubud art market, not in the main street so very quiet. Very lovely! Bed was not very comfortable and no hot water, but the staff were helpful and friendly. Good location for local restaurants and quiet street. Breakfast was very simple like toast and small fruit selection, but no choice. Free filtered water was useful. the breakfast is very nice. we have a good memory there.